After leaving their customers’ personal information wide open to attack on unsecured servers running ancient software, Sony’s lawyers decided to simply make their customers sign away the right to make claims for damage done by Sony’s negligence. If you don’t want to do so, you must send a “clear statement” about it via postal mail. I do not yield, capitulate, surrender, or otherwise stupidly waive my legal right to resolve disputes with any Sony entity through individual or class action litigation. I make no agreement or commitment to needlessly subject myself to the inferior system of arbitration. Earlier this year, your failure to protect your customers’ personally identifiable information through the most basic of information technology security processes resulted in direct harm to us. You should be working to make sure this never happens again, rather than avoiding legal accountability to your customers for future misdeeds. Trademark and copyright holders frequently characterize piracy as a legal failure, arguing that tougher laws and increased enforcement are needed to stem infringing activity. But a new global study on piracy, backed by Canada’s International Development Research Centre, comes to a different conclusion. Following several years of independent investigation in six emerging economies, the report concludes that piracy is chiefly a product of a market failure, not a legal one. Read more about the 400-page report commissioned by the Canadian government at thestar.com . Like many, I reacted very negatively to Apple’s new policy: any paid content inside iOS apps be available through Apple’s subscription system, must be available at the lowest price, and must give Apple a 30% cut of that price. This is what galls some: Apple is doing this because they can, and no other company is in a position to do it. This is not a fear that in-app subscriptions will fail because Apple’s 30 percent slice is too high, but rather that in-app subscriptions will succeed despite Apple’s (in their minds) egregious profiteering. I.e. that charging what the market will bear is somehow unscrupulous. To the charge that Apple Inc. is a for-profit corporation run by staunch capitalists, I say, “Duh”. Gruber has scored a direct hit on Apple’s strategy, and his explanation makes it seem very solid for Apple, its customers, and content creators. The biggest losers are Apple’s competitor middle-men. I think Apple’s main interest is being the best damned middle man in the business. The only problem is that some of those middle-men make products I really like, and Apple will only play ball with them if Apple gets to make the rules. 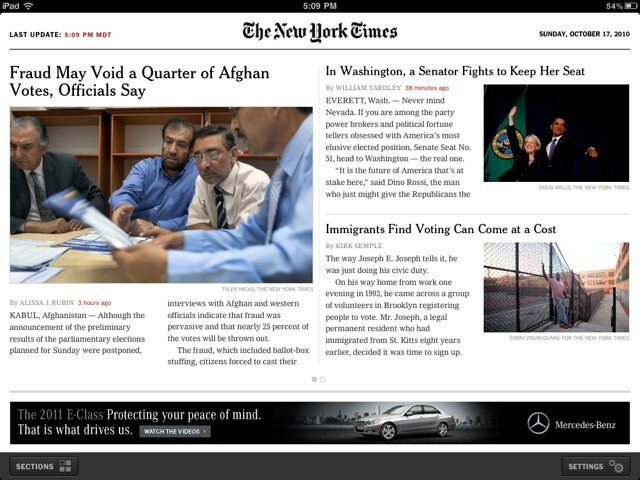 New York Times for iPad: Legitimate heir to the Newspaper? From paper to pixels: The Times and other media have yet to find an economically sustainable replacement for their paper-based products. This year’s announcement of the iPad seemed to change the publishing industry’s outlook on doing business over the Web. Instead of the hyperlinked, non-linear, short-attention-span, copy/paste-friendly nature of a desktop Web browser, the iPad offers a publishing platform similar to their paper product – with an iPad app, the publisher has verticalized control of available content, its layout, navigation experience, and – most importantly – revenue generation methods. On October 15, the Times released “NYTimes for iPad,” (iTunes Link) labeling it “free until early 2011.” In testing it, I’ve decided it’s an excellent application in its own right, and could potentially be a great sign for the future of print journalism, but it could be yet another business fumble if the company doesn’t execute the proper balance between advertising, consumer pricing and usability.